Marchant Brooks and Co. were auctioneers, land, house and estate agents, surveyors and valuers, with offices in Westminster Bank Chambers. Their sale rooms, Central Sale Rooms, were on Causeway Lane; the premises had been used by another auctioneer, W. H. Marriott, at the beginning of the twentieth century. This somewhat damaged photograph records the sale of the Residential Estate at Holloway known as Lea Hurst, a "Historic Mansion" because it had been the home of Miss Florence Nightingale (shown on the sale board in the photograph). After the death of Mr. Louis Shore Nightingale in 1940 the house had been used as a nursing home. The property was offered for sale in 1946 and the house was bought before the auction date by the estate of Lt.-Col. E. S. Halford as a permanent memorial to Florence Nightingale. Marchant Books offered the remaining thirty lots on Thursday 23rd May 19462]. The auctioneer, J. Marchant Brooks, is standing at the front of the room. Four years later he was to sell the Warney Estate at Darley (see Darley Dale, The Warney Mill Estate (1) in a different part of this web site). Lea Hurst was on the market again in 1951, and the sale coincided with the final day's filming of the last scenes of "The Lady with the Lamp", a film starring Anna Neagle. 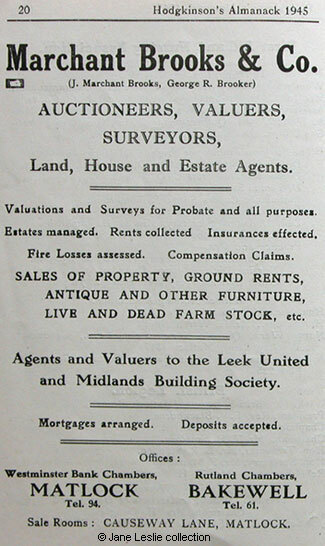 On the left is the sale notice published in the Matlock Mercury a short time before. The property was bought by a 45 year old Whatstandwell publican, Mr. William Bowmer. He subsequently told the Mercury that he had "bought he house to try to keep it as it has been until now and to respect the associations with Miss Nightingale". 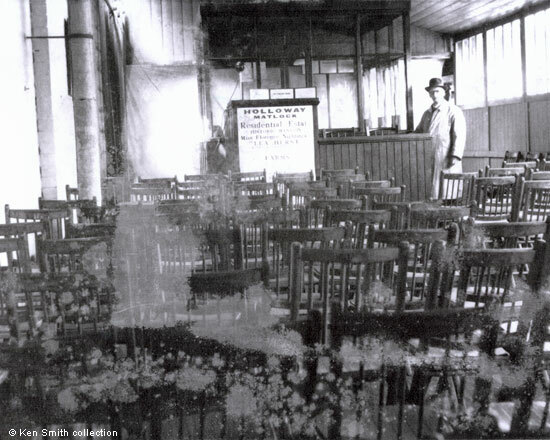 Although the auctioneer's sale room has now gone from Causeway Lane, the building is still there. It is now (2013) the Thomas Cook building. On the side wall, at first floor level, a painted sign is still visible although it is now in unreadable. Also see Matlock: Letterheads of Local Businesses, 1900-1949 (3). 1. Photograph in the collection of and provided by and © Ken Smith. 2. Sale Notice from a copy of the Matlock Mercury © Susan Tomlinson collection. 3. Advertisement for Marchant Brooks from "Hodgkinson's Matlock and Historic Almanack, 1945 (War Edition)" © Jane Leslie collection. "Derby Daily Telegraph" 21 May 1946, notice of sale. "Derby Daily Telegraph", 22 May 1946, report of house sale.